This book is a dream project of the Association of Cutaneous Surgeons (India) [ACS(I)] Academy and involves the description of various surgical procedures in a step wise manner. It will contain the detailed steps involved in doing various dermatosurgical procedures accompanied by figures for each of the steps. This would help all budding and practicing dermatosurgeons to easily carry out these procedures just by reading and having a visual outlook of the respective surgeries. The chapters are contributed by eminent dermatosurgeons, who are experts in their respective fields from all over the country. 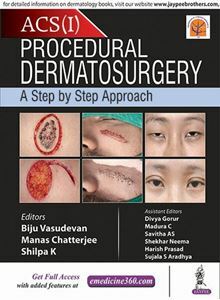 The book will be a ready reference for dermatologists, dermatosurgeons, dermatology residents and will also be a guide for other specialties when they encounter a dermatosurgery case. Tips and tricks, modifications, complications and recent advances will be highlighted for each procedure. The chapters will be concise and have been made crisper by addition of tables, flowcharts and algorithms.